SZABIST was founded 1995, it is a private university and have many campuses with main campus in Karachi. SZABIST provides a wide range of undergraduate programs for its applicants and focused on providing best quality of education to them. Due to their hard work and consistency SZABIST has earned a good name in very short period of time. SZABIST fee structure is bit high but to facilitate poor and needy students they also provide need based scholarships. Every year thousands of students apply for SZABIST entry test but because of limited seats not much can succeed. If someone want to secure his admission he/she should need to work very hard. Pakprep.com is the best online entry test preparation website for any medical and engineering university. Pakprep.com contains more than 15000 quality solved MCQ’s along with their explanation prepared by highly qualified teachers from all over Pakistan. All of our data is separated subject and then topic wise, to make preparation easy for our students. 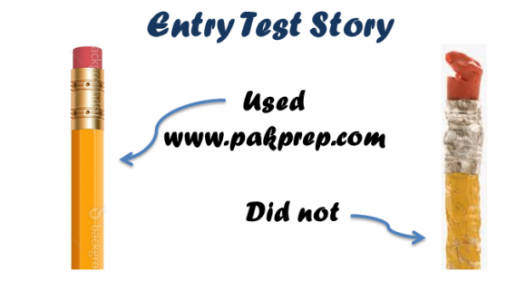 Pakprep.com also provides facility of MOCK test which are prepared according to university criteria and also marked according to their standards. We also facilitate our students with providing past papers of all top universities of Pakistan. Smart analytics keeps record of all tests taken by our students and also keep a separate log of all mistakes. This feature help our students to examine their performance and to identify their weak areas. To start your preparation for any medical or engineering test with Pakprep.com please CLICK HERE. This entry was posted in SZABIST and tagged answers key for NTS, Best way to prepare for NTS, Download NTS Past Papers, Electrical Engineering admission requirements, How to Download NTS form, How to prepare for NTS, Important NTS MCQs, NAT, NAT English MCQs, NAT for computer Science, NAT for Pre-Engineering, NAT IE Past Papers, NAT IE Preparation, NAT Pakistan, NAT Past Papers, NAT Solved MCQs, NAT Subject MCQs, NAT test, NAT test pattern, NTS, NTS affiliated Universities, NTS Biology, NTS Biology MCQ's, NTS Chemistry, NTS Chemistry MCQ's, NTS Chemistry MCQ's Preparation, NTS Engineering, NTS Engineering TEST, NTS Engineering test pattern, NTS Entrance Test, NTS Entry Test, nts fee, NTS ICS, NTS IE, NTS Intelligence MCQ's, NTS Intelligence MCQ's Preparation, NTS Maths MCQ's Preparation, NTS MCQs, NTS MCQs solved, NTS NAT Preparation, NTS NAT-IE, NTS old papers, NTS Pakistan, NTS Past Papers, NTS Physics, NTS Physics MCQ's, NTS Physics MCQ's Preparation, NTS Preparation Online, NTS Quantatative MCQ's Preparation, NTS Quantitative MCQ's, NTS roll number, NTS roll number slip, NTS test, NTS Test Pattern, SZABIST, SZABIST Admission, SZABIST admission 2018, SZABIST Admissions, SZABIST Admissions 2018, SZABIST BS Programs, SZABIST dates, SZABIST eligibility, szabist mcqs, szabist registration, szabist registration date, szabist registration dates, SZABIST solved papers, SZABIST test, SZABIST test date, SZABIST test date 2018, SZABIST test dates, SZABIST test dates 2018, SZABIST Undergraduate program, What is NTS, What is NTS Entry Test on December 10, 2018 by Pakprep.com Admin. SZABIST is also known as Shaheed Zulfikar Ali Bhutto Institute Of Science And Technology. It is a private university established in 1987 and its founder was Javaid Laghari. SZABIST have their campuses in Karachi, Islamabad, Larkana, Dubai (UAE) and Hyderabad. SZABIST is one of the highly ranked university of HEC. They have earned a good name in the society of Pakistan as well as out of the country. SZABIST is also ranked among the best Science and Technology and MBA schools in Asia by the CNN-Time publication Asia week (2003). SZABIST is also listed in the CNN Executive Education Schools. Last date of registration of 2nd round 2018 is 15th January 2018. Students willing to get admission in SZABIST they have to appear in SZABIST test. Candidate can also apply for SZABIST on the basis of NTS NAT test. SZABIST is one of the affiliated university with NTS NAT test. Due to their low eligibility criteria many students apply for the admission. It’s a high competition contest in which thousands compete but only few can succeed due to limited seats. So if you want to get admission in SZABIST you need to work hard and prepare yourself according to the test. Many students fails because they cannot manage their time properly. Pakprep.com can help you with that, we have best online preparation site used by thousands of students. We have 15,000+ thousand MCQ’s with their explanation. You can prepare yourself for every chapter and can track your performance over the time. We also have MOCK tests of different universities which will give you the real time scenario of the entry test. To start your preparation for NTS NAT and SZABIST Click here. 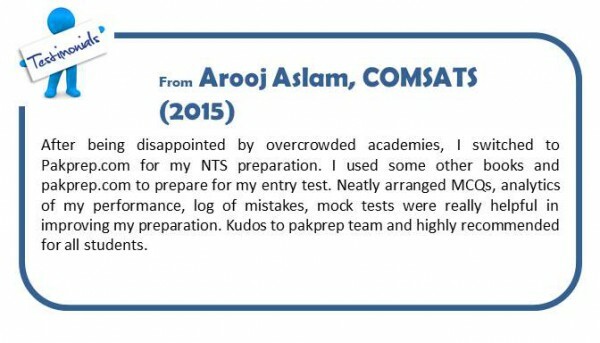 This entry was posted in NTS NAT, SZABIST and tagged answers key for NTS, Best way to prepare for NTS, Download NTS Past Papers, HEC Scholarship for Undergraduate students, How to prepare for NTS, NAT, NAT English MCQs, NAT for computer Science, NAT for Pre-Engineering, NAT for Pre-Medical, NAT IE Preparation, NAT IM Past Papers, NAT Pakistan, NAT Solved MCQs, NAT test pattern, NTS, NTS Biology, NTS Biology MCQ's, NTS Chemistry, NTS Chemistry MCQ's, NTS Chemistry MCQ's Preparation, NTS Computer Science, NTS Engineering, NTS Engineering TEST, NTS Engineering test pattern, NTS English, NTS English MCQ's, NTS Entrance Test, NTS Entry Test, nts fee, NTS Intelligence MCQ's, NTS Medical Answer Key, NTS NAT Preparation, NTS NAT-IE, NTS NAT-IM, NTS Pakistan, NTS Physics, NTS Physics MCQ's, NTS test, NTS Test Pattern, online preparation for NTS test, sindh NTS, SZABIST, SZABIST Admission, SZABIST Admissions 2017, SZABIST BS Programs, SZABIST dates, SZABIST eligibility, szabist registration date, szabist registration dates, SZABIST solved papers, SZABIST test, SZABIST test date 2018 SZABIST, SZABIST test dates 2018, SZABIST Undergraduate program, What is NTS Entry Test on January 4, 2018 by Pakprep.com Admin. Shaheed Zulfikar Ali Bhutto Institute of Science and Technology ((SZABIST) announced admissions of bachelor programs for spring 2018 session. Shaheed Zulfikar Ali Bhutto Institute of Science and Technology (SZABIST) is one of the best and recognized Institute of Higher Education Commission (HEC), Pakistan. Shaheed Zulfikar Ali Bhutto Institute of Science and Technology (SZABIST) has its campuses in Karachi, Islamabad, Hyderabad, Larkana and Dubai (UAE). SZABIST offer various undergraduate programs in field of Business and IT. Last date to apply for SZABIST is 13th December 2017. SZABIST on campus test will held on 15th December to 19th December. SZABIST is one of the affiliated university with NTS NAT test, so students can also apply for SZABIST on the basis of their NTS NAT score. Eligibility criteria of SZABIST is low for Business and IT fields due to which many students apply for the admission. Pakprep.com provide complete material for the preparation of NTS NAT test. We have more than 15,000+ MCQ’s with answers and explanation which helps students in getting good marks in entry test. Click here to start your preparation today. Here is the detailed process of admission for SZABIST Bachelor Programs. This entry was posted in NTS NAT, SZABIST and tagged answers key for NTS, Best way to prepare for NTS, Download NTS Past Papers, Electrical Engineering admission requirements, How to Download NTS form, How to prepare for NTS, Important NTS MCQs, NAT, NAT English MCQs, NAT for Pre-Engineering, NAT IE for IST Admission, NAT IE Preparation, NAT Pakistan, NAT Past Papers, NAT Subject MCQs, NAT test, NAT test pattern, NAT_IE test pattern, NTS, NTS affiliated Universities, NTS Biology, NTS Biology MCQ's, NTS Chemistry, NTS Chemistry MCQ's, NTS Chemistry MCQ's Preparation, NTS Engineering, NTS Engineering TEST, NTS Engineering test pattern, NTS English, NTS English MCQ's Preparation, NTS Entrance Test, nts fee, NTS IE, NTS Intelligence MCQ's, NTS Intelligence MCQ's Preparation, NTS Maths MCQ's Preparation, NTS MCQs, NTS MCQs solved, NTS NAT Preparation, NTS NAT-IE, NTS old papers, NTS ols paper, NTS Pakistan, NTS Past Papers, NTS Physics, NTS Physics MCQ's, NTS Physics MCQ's Preparation, NTS preparation, NTS Preparation Online, NTS Quantatative MCQ's Preparation, NTS Quantitative MCQ's, NTS SOLVED MCQS, NTS test, NTS Test Pattern, SZABIST, SZABIST Admission, SZABIST admission 2017, SZABIST Admissions, SZABIST Admissions 2017, SZABIST BS Programs, SZABIST dates, SZABIST eligibility, szabist mcqs, szabist registration, szabist registration date, szabist registration dates, SZABIST solved papers, SZABIST test, SZABIST test date, SZABIST test date 2017, SZABIST test dates, SZABIST test dates 2017, SZABIST Undergraduate program, What is NTS, What is NTS Entry Test on November 28, 2017 by Pakprep.com Admin. Shaheed Zulfikar Ali Bhutto Institute of Science and Technology (SZABIST) is approved and recognized by Higher Education Commission (HEC), Pakistan, as a degree granting institution. SZABIST has campuses in Karachi, Islamabad, Hyderabad, Larkana and Dubai (UAE). SZABIST offer various undergraduate programs in field of Business and IT. SZABIST is one of the affiliated university with NTS NAT test, so students can apply for SZABIST on the basis of their NTS NAT score. Eligibility criteria of SZABIST is low for Business and IT fields due to which many students apply for the admission. Pakprep.com provide complete material for the preparation of NTS NAT test. We have more than 15,000+ MCQ’s with answers and explanation which helps students in getting good marks in entry test. Click here to start your preparation today. Here is the list of undergraduate programs offered by SZABIST. This entry was posted in NTS, NTS NAT, SZABIST and tagged answers key for NTS, Best way to prepare for NTS, Download NTS Past Papers, Electrical Engineering admission requirements, How to Download NTS form, How to prepare for NTS, Important NTS MCQs, NAT, NAT English MCQs, NAT for computer Science, NAT for Pre-Engineering, NAT IE Past Papers, NAT IE Preparation, NAT Pakistan, NAT Past Papers, NAT Solved MCQs, NAT Subject MCQs, NAT test, NAT test pattern, NTS, NTS affiliated Universities, NTS Biology, NTS Biology MCQ's, NTS Chemistry, NTS Chemistry MCQ's, NTS Chemistry MCQ's Preparation, NTS Engineering, NTS Engineering TEST, NTS Engineering test pattern, NTS Entrance Test, NTS Entry Test, nts fee, NTS ICS, NTS IE, NTS Intelligence MCQ's, NTS Intelligence MCQ's Preparation, NTS Maths MCQ's Preparation, NTS MCQs, NTS MCQs solved, NTS NAT Preparation, NTS NAT-IE, NTS old papers, NTS Pakistan, NTS Past Papers, NTS Physics, NTS Physics MCQ's, NTS Physics MCQ's Preparation, NTS Preparation Online, NTS Quantatative MCQ's Preparation, NTS Quantitative MCQ's, NTS roll number, NTS roll number slip, NTS test, NTS Test Pattern, SZABIST, SZABIST Admission, SZABIST admission 2017, SZABIST Admissions, SZABIST Admissions 2017, SZABIST BS Programs, SZABIST dates, SZABIST eligibility, szabist mcqs, szabist registration, szabist registration date, szabist registration dates, SZABIST solved papers, SZABIST test, SZABIST test date, SZABIST test date 2017, SZABIST test dates, SZABIST test dates 2017, SZABIST Undergraduate program, What is NTS, What is NTS Entry Test on November 9, 2017 by Pakprep.com Admin. Shaheed Zulfikar Ali Bhutto Institute of Science and Technology is also known as SZABIST is one of the highly ranked university of HEC. Here is the last chance to apply in SZABIST for undergraduate admissions. Students willing to get admission in SZABIST they have to appear in SZABIST test which is going too held on 21st July 2017. Last date of registration is 17th July 2017. Students having valid NTS NAT results can also apply for SZABIST on the basis of NTS NAT results. SZABIST is one of the affiliated university of NTS and accept NTS NAT score for admission. Due to their low eligibility criteria many students apply for the admission. www.pakprep.com provides complete material for the preparation of NTS NAT test. We have more than 15,000+ fully explained MCQ’s which also include Quantitative, Analytical and Intelligence (Verbal non Verbal) MCQ’s with answers and explanation for NTS NAT preparation. To start your preparation Click here. This entry was posted in NTS NAT, SZABIST and tagged Best way to prepare for NTS, Biology MCQs with explanation, Download NTS Past Papers, How to Download NTS form, How to prepare for NTS, Important NTS MCQs, NAT English MCQs, NAT for computer Science, NAT for Pre-Engineering, NAT IE Past Papers, NAT IE Preparation, NAT IM Past Papers, NAT Pakistan, NAT Past Papers, NAT Solved MCQs, NAT Subject MCQs, NAT test, NAT test pattern, NTS, NTS affiliated Universities, NTS Biology, NTS Biology MCQ's, NTS Chemistry, NTS Chemistry MCQ's, NTS Chemistry MCQ's Preparation, NTS Computer Science, NTS Engineering, NTS Engineering TEST, NTS Engineering test pattern, NTS English, NTS English MCQ's, NTS English MCQ's Preparation, NTS Entrance Test, NTS Entry Test, nts fee, NTS ICS, NTS IE, NTS IM, NTS Intelligence MCQ's, NTS Intelligence MCQ's Preparation, NTS Maths MCQ's Preparation, NTS MCQs, NTS MCQs solved, NTS NAT Preparation, NTS NAT-IE, NTS old papers, NTS ols paper, NTS Pakistan, NTS Past Papers, NTS Physics MCQ's, NTS preparation, NTS Preparation Online, NTS Quantatative MCQ's Preparation, NTS Quantitative MCQ's, NTS Solved paper, nts solved papers, NTS test, SZABIST, SZABIST Admission, SZABIST admission 2017, SZABIST Admissions, SZABIST Admissions 2017, SZABIST dates, SZABIST eligibility, szabist mcqs, szabist registration, szabist registration date, szabist registration dates, SZABIST solved MCQs, SZABIST solved papers, SZABIST test, SZABIST test date, SZABIST test date 2017, SZABIST test dates, SZABIST test dates 2017, SZABIST Undergraduate program, What is NTS, What is NTS Entry Test on July 11, 2017 by Pakprep.com Admin. SZABIST is also known as Shaheed Zulfikar Ali Bhutto. It is a private university established in 1987 and its founder was Javaid Laghari. SZABIST have their campuses in many cities of Pakistan and also in UAE but their main campus is in Karachi. SZABIST is one of the highly ranked university of HEC. During their time they earned a good name in the society of Pakistan as well as out of the country. SZABIST is the only university which was recognized by Business Week, the leading international magazine, Asia Inc, leading Asian Magazine. Registration of fall 2017 session has been started last date to apply for SZABIST is 17th July 2017. Test will start from 21st July to 31st July. Students willing to get admission in SZABIST they have to appear in SZABIST test. Candidate can also apply for SZABIST on the basis of NTS NAT test. SZABIST is one of the affiliated university with NTS NAT test. Due to their low eligibility criteria many students apply for the admission. It’s a high competition contest in which thousands compete but only few can succeed due to limited seats. So if you want to get admission in SZABIST you need to work hard and prepare yourself according to the test. Many students fails because they cannot manage their time properly. Pakprep.com can help you with that, we have best online preparation site used by thousands of students. We have 15,000+ thousand MCQ’s with their explanation. You can prepare yourself for every chapter and can track your performance over the time. We also have MOCK tests of different universities which will give you the real time scenario of the entry test. To start your preparation for NTS NAT and SZABIST Click here. This entry was posted in NTS NAT, SZABIST and tagged Best way to prepare for NTS, Download NTS Past Papers, How to Download NTS form, How to prepare for NTS, Important NTS MCQs, NAT English MCQs, NAT for computer Science, NAT for Pre-Engineering, NAT IE Past Papers, NAT IE Preparation, NAT Pakistan, NAT Past Papers, NAT Solved MCQs, NAT Subject MCQs, NAT test, NAT test pattern, NAT_IE test pattern, NTS affiliated Universities, NTS Chemistry, NTS Chemistry MCQ's, NTS Chemistry MCQ's Preparation, NTS Computer Science, NTS Engineering, NTS Engineering TEST, NTS Engineering test pattern, NTS English, NTS English MCQ's, NTS English MCQ's Preparation, NTS Entrance Test, NTS Entry Test, nts fee, NTS ICS, NTS IE, NTS Intelligence MCQ's, NTS Intelligence MCQ's Preparation, NTS Maths MCQ's Preparation, NTS MCQs, NTS NAT Preparation, NTS NAT-IE, NTS old papers, NTS ols paper, NTS Pakistan, NTS Past Papers, NTS Physics MCQ's, NTS Physics MCQ's Preparation, NTS preparation, NTS Preparation Online, NTS Quantatative MCQ's Preparation, NTS Quantitative MCQ's, NTS SOLVED MCQS, NTS test, NTS Test Pattern, online preparation for NTS test, SZABIST, SZABIST Admission, SZABIST admission 2017, SZABIST Admissions, SZABIST Admissions 2017, SZABIST dates, SZABIST eligibility, szabist mcqs, SZABIST solved MCQs, SZABIST solved papers, SZABIST test, SZABIST test date, SZABIST test date 2017, SZABIST test dates, SZABIST test dates 2017, SZABIST Undergraduate program, szabit Admissions, Undergraduate program, What is NTS, What is NTS Entry Test on June 8, 2017 by Pakprep.com Admin.